The R-PLEX Human NGAL/LCN2 Antibody Set includes a matched capture and detection antibody pair and calibrator for the quick and easy measurement of NGAL/LCN2 in biological samples. R-PLEX products leverage MSD’s electrochemiluminescence technology for better sensitivity and a larger dynamic range than traditional ELISAs. R-PLEX matched antibody sets enable the development of singleplex and multiplex immunoassays. Individual assays may be developed using MSD avidin- or streptavidin-coated plates. Custom multiplex assays with any combination of R-PLEX analytes, as well as R-PLEX plus U-PLEX analytes can be developed on U-PLEX MULTI-SPOT plates. To learn more about the advantages of R-PLEX products click here. 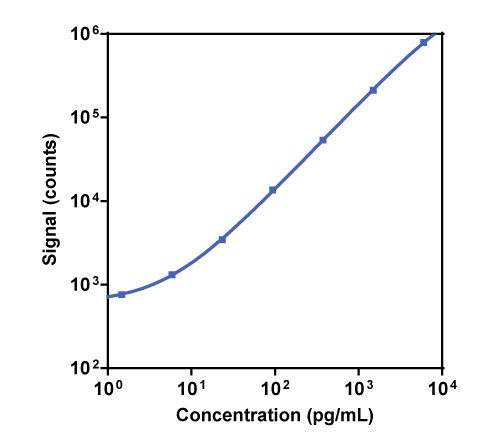 Calibration curve for the R-PLEX Human NGAL/LCN2 Antibody Set was assessed and representative data are presented below. Description - Neutrophil Gelatinase-Associated Lipocalin (NGAL, Lipocalin-2, LCN2, p25, oncogene 24p3, MSFI) is a protein that traffics iron across cell membranes. NGAL maintains the intracellular iron concentration at normal levels. NGAL is secreted in response to interactions of certain toll-like receptors with bacteria. It then sequesters iron-containing bacterial siderophores, helping to limit bacterial growth. NGAL also increases in blood and urine within two hours of kidney injury. It is indicative of the severity of kidney injury, and may thus be a useful tool in kidney injury research.